Toward the beginning of the sixteenth century the Opera del Duomo—the advisory group of authorities accountable for the enrichment and support of the Florence church—had a dubious incomplete venture staring its in the face. A record from 1501 alludes to a monstrous scarcely started statue, “a specific man of marble, named David, seriously shut out and laid on its back in the yard.” The stone was a remaining from a long-running enhancing venture: in 1408 the board of trustees had chosen to adorn the roofline around the vault of the church with gigantic statues of scriptural prophets and fanciful figures. The initial two, set up in the mid fifteenth century, were a statue of Joshua etched in earthenware by Donatello and painted white to look like marble, and a statue of Hercules, etched by one of Donatello’s understudies, Agostino di Duccio. A statue of David, the Biblical saint who killed the mammoth Goliath, had been requested in 1464. This commission went to Agostino, and a tremendous piece of marble was removed from the Carrara quarries in Tuscany, Italy, for the task. For obscure reasons Agostino surrendered the task in the wake of doing just a little work, for the most part roughing out around the legs. Another stone worker, Antonio Rossellino, was enlisted to assume control over the task in 1476, however he pulled out very quickly, refering to the low quality of the marble. (Present day logical investigations of the marble have affirmed that it is in fact of fair quality.) Left without an artist yet excessively costly, making it impossible to discard, the monstrous section sat out in the components for a 250 years. In 1504, as Michelangelo completed his work, Florentine authorities inferred that the statue was too substantial to put in its expected area on the roofline of the house of prayer. An advisory group of craftsmen, including Sandro Botticelli and Leonardo da Vinci, met and chose that the statue ought to be put at the passageway to the Palazzo Vecchio in Florence. In 1873 it was moved inside to the Galleria dell’Accademia in Florence and an imitation was raised at the first site. 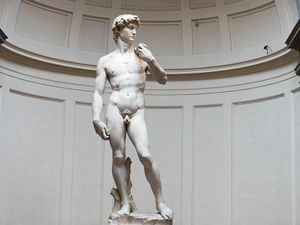 There are a few stylish parts of the David statue that might be associated with the convoluted procedure by which it was dispatched and made. The figure, albeit solid, is slimmer than the muscle head like physical make-ups that are regular of Michelangelo’s different works. This might be on the grounds that the marble piece was limited, having been cut with the more slender statues of Donatello and Agostino’s period as a top priority. The nonattendance of David’s conventional accessories, a sword and the separated head of Goliath, might be on account of there was no space to cut them in the square of marble or conceivably in light of the fact that they would have been undetectable once the statue was set up on the house of God rooftop. In like manner, David’s lopsidedly substantial right hand and conspicuous outward appearance may have been overstated to guarantee that they would be readable to onlookers on the ground. Few statues are as enduring and iconic as Michelangelo’s David. But while much of the world could sketch this majestic masterpiece from memory, few know the quirks and curiosities that went into its creation. 1. IT’S A RELIGIOUS STATUE. At first glance, Michelangelo’s famed naked man may not scream “biblical hero.” But if you look closely, David cradles a sling over his left shoulder and clutches a rock in his right hand. These items and the statue’s name identify the subject as the David who faced down the vicious giant Goliath. Michelangelo broke from convention by not including the future king’s fearsome foe in his sculpture. In a further departure from tradition, art historians believe David depicts the legendary underdog before the great battle, in part because of the anxiety that’s clearly etched on his face. 2. IT’S LARGER THAN LIFE. David stands 17 feet tall, nearly three times the size of the average man. 3. HIS RIGHT HAND IS OUT OF PROPORTION. It’s too big to fit perfectly with the rest of his body. This asymmetry is believed to be Michelangelo’s clever nod to David’s nickname, manu fortis—strong of hand. You can tell he’s a southpaw from where the slingshot lies—but strangely, his body position is more suggestive of a righty. 5. THE STATUE IS CARVED FROM A SINGLE BLOCK OF UNWANTED MARBLE. The block of marble that became one of history’s most famous masterpieces proves the old cliché about one man’s trash being another’s treasure. Michelangelo created David from a piece of marble that had been twice discarded by other sculptors. Agostino di Duccio gave up on a project using the block, after which it sat untouched for 10 years. At that point, Antonio Rossellino took a crack at the block but decided it was too much of a pain to work with. When Michelangelo finally got his hands on it, the marble had been waiting for 40 years for someone who was up to its challenge.